The dining room at Le Cellier creates a distinctive dining atmosphere — and it’s one that I love. Low ceilings and dark moldings make it feel cozy. And while there’s tons of lighting, somehow Le Cellier still manages to be a little shadowy. Many curved stone openings work to separate spaces, and by the time you navigate your way into the dining room, you feel like you’ve gone deep into the earth. Seating is at both tables and chairs and banquettes. In the realm of restaurant seating, this is pretty comfy. And if you’re dining with kiddos, the banquettes can be really helpful. But note that if you’re a party of two, that banquette seating can be a little too close to your neighbors for comfort — request a table instead. Design details like massive metal light fixtures with visible chains give you almost a castle feel, and the lights designed to look like melted candles are pretty great. 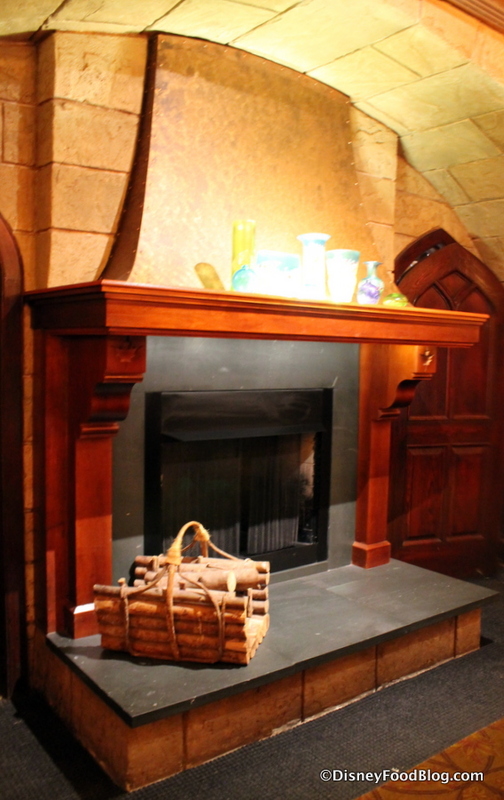 There’s also a fireplace to create a warm, homey feeling. 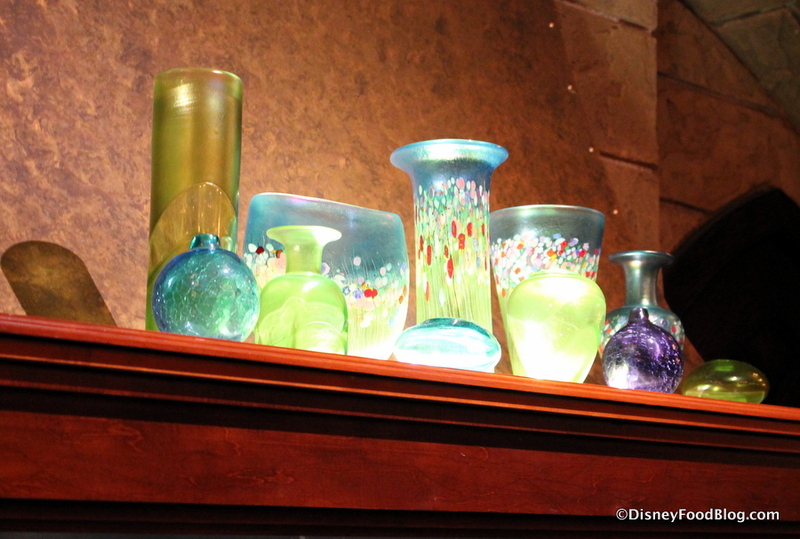 But glass details add pops of unexpected color and points of interest. Despite the drama of the overall design, the space does not detract from the focus of your experience: the food. Le Cellier Steakhouse is known for its steak, of course, but also for its starters and creative offerings of poutine. But I was interested in one of the components of From The Larder: Pig, Pig, and More Pig, which is Le Cellier’s take on charcuterie. I saw on the menu that the charcuterie came with Whipped Pork Fat Butter — and I had to know what it was. Is it just whipped pork fat? Is it butter with pork fat incorporated into it? Well, I asked for a little side of it to see for myself. And…well…here’s what I got. It’s basically…straight lard. Whipped maybe, but still straight pork fat. When I asked the server about the guest reaction to this, she said people either love it or hate it — not a lot of in-between. She mentioned that those who love it usually spread it on their bread. Me? I took a taste, but didn’t need any more. I guess I fall into the “hate it” category! But I figured you guys would be curious like I was, so there you go! 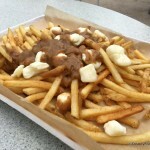 Of course, no trip to Le Cellier is complete for me without a bowl of poutine. Or, in this case, three bowls of poutine. But there’s something new going on with the poutine here. We recently let you in on a secret menu poutine that applies to Annual Passholders (but can be had by anyone!). 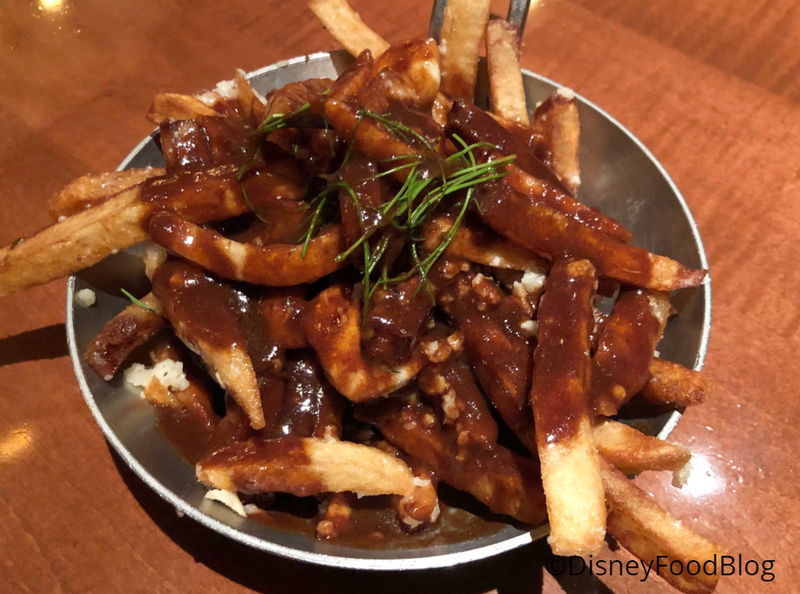 Annual Passholders who make their Advance Dining Reservation via My Disney Experience will receive a menu with the added Annual Passholder Poutine — Le Cellier’s Signature Poutine. It will not appear on the regular menu received by non-Annual Passholders, but anyone can request this, Passholder or not. So don’t be shy if you want to try it! 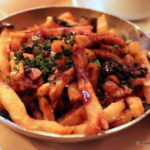 These French Fries topped with Red Wine Reduction, white truffle, and Canadian Cheddar are totally worth a try! Even if it’s not on your menu — go ahead and request it. Beef Bourguinon Poutine is offered on both menus. This is a delicious layering of French Fries, Gruyère, Beef Bourguignon Gravy, Garlic Aïoli, and Truffle. It’s full of bold, sophisticated flavors… and French Fries. Which are awesome! Now here’s where things get super creative. 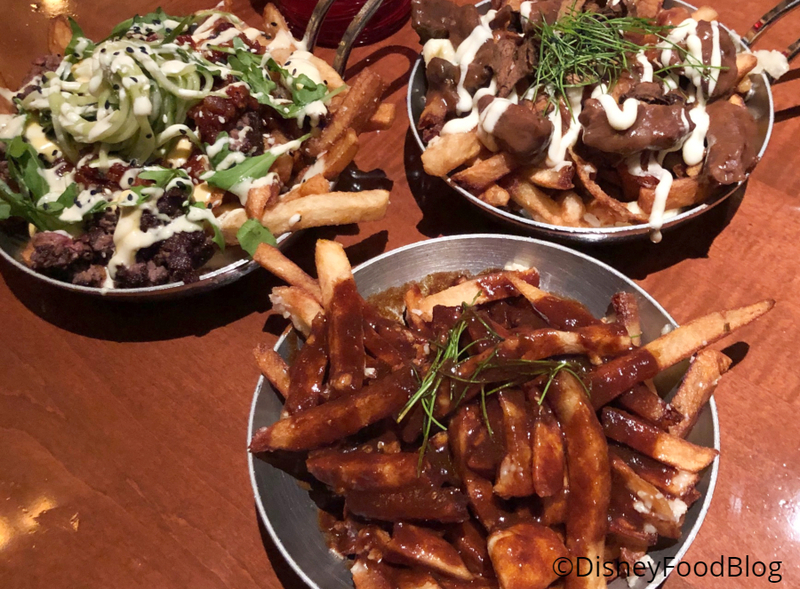 Throughout 2019, Le Cellier will offer a different poutine each month that represents one of the World Showcase countries. 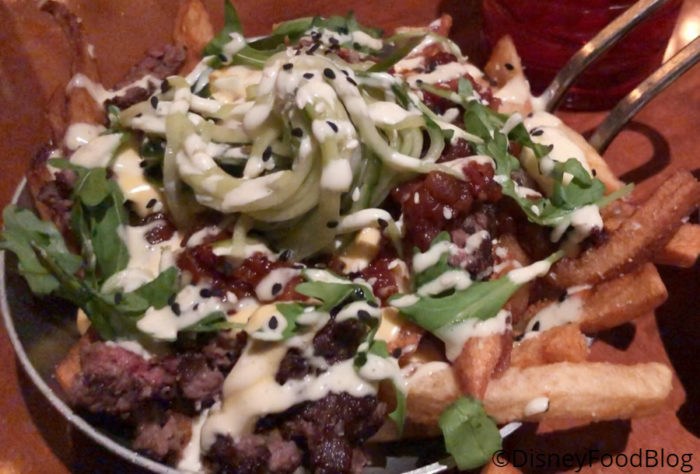 January was the American Pavilion, and that means Bacon Cheeseburger Poutine! This is Wagyu Ground Beef, Applewood Smoked Bacon, Cheese Curds, American Cheese Whiz, Tomato Jam, Dill Pickle Slaw (! ), and Dijon Mustard Aioli. If it sounds like a lot, that’s because it is. But it tastes like a fabulous cheeseburger: crispy bacon, strong flavors from the dill and dijon plenty of gooey cheese from the Whiz. So good! Entrees at Le Cellier are limited in number, but it’s clear they strive for quality over quantity here. 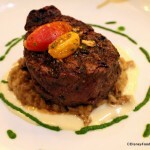 Le Cellier Filet Mignon is arguably the steakhouse’s most popular item, and it delivers in tenderness and quality. Sides right now include the beloved Mushroom Risotto and Truffle Butter Sauce and Asparagus-Tomato Relish. This was great, as per usual. But for my money, I prefer the more pronounced beef flavor of the USDA Prime Rib-Eye Steak, which I actually ordered with the Filet sides (including extra Truffle Butter Sauce!). The Rib-Eye was beautifully cooked and completely satisfying in terms of flavor. A million times yes on this! For dessert, the Maple Creme Brulee is a terrific choice. (We have the recipe here, if you want to make it at home!) The hardened sugar top cracks with the tap of a spoon, the maple flavor comes through but not in a sickeningly sweet way, and the maple cookie is a nice foil to the smooth custard. This has been on the menu for years, and, thankfully, hasn’t gotten too much of an overhaul. 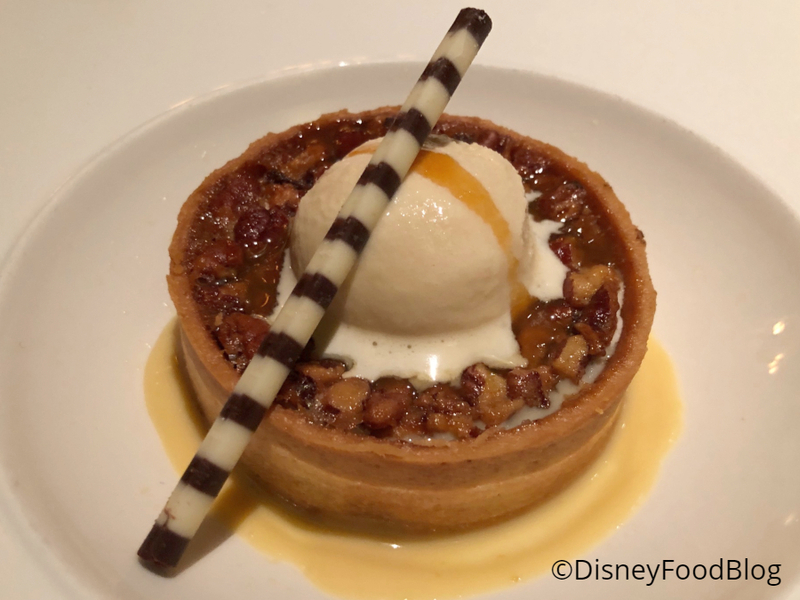 We also ordered the Warm Pecan-Brown Butter Tart, which is a play on sweet and salty. The Brown Butter Anglaise offers richness, and the Whisky Caramel is a good addition. But overall, as is often the case with Signature restaurant desserts these days, this fell flat. It’s relatively boring, and doesn’t make me feel like I’ve gotta get back to Le Cellier to have it again. That’s something that’s started to bother me a lot about Signature restaurant desserts. I feel like there’s a lot of small, tasteless desserts — or super-fancy-but-equally-insubstantial desserts — at Signature restaurants these days. I’ve never wanted to have “cheesecake scented foam” or whatever the latest trend is for dessert. Perhaps my palate is just immature when it comes to sweet trends these days, but I’ll go to Boatwright’s or Beaches and Cream and have incredible desserts any day of the week instead of shelling out $12 for a typical tiny, tasteless Signature restaurant dessert. OK, off my dessert soapbox. 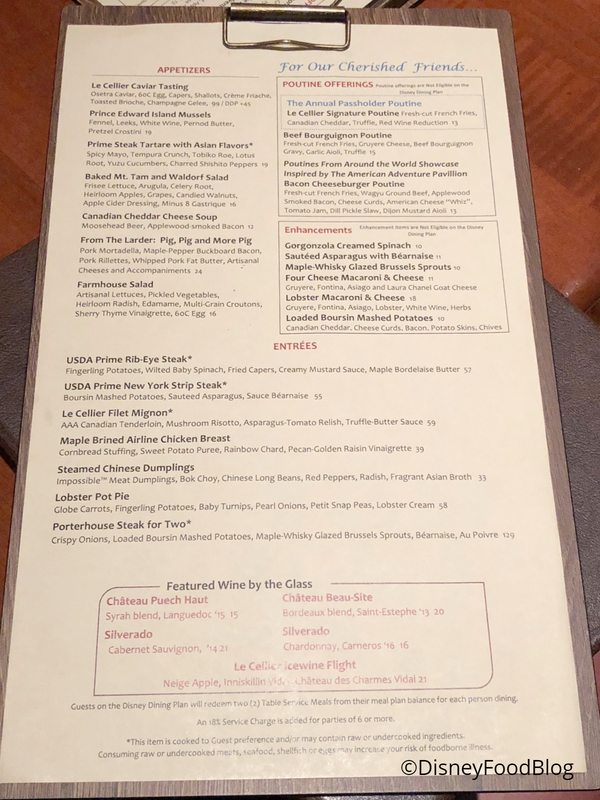 Le Cellier catches some grief for its signature status for both dinner and lunch, but even with that designation (and the accompanying pricetag! ), I still like it and will continue to patronize Le Cellier. 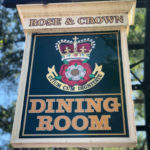 The atmosphere is inviting, the food is terrific, the service is good, and the overall experience is really high quality. 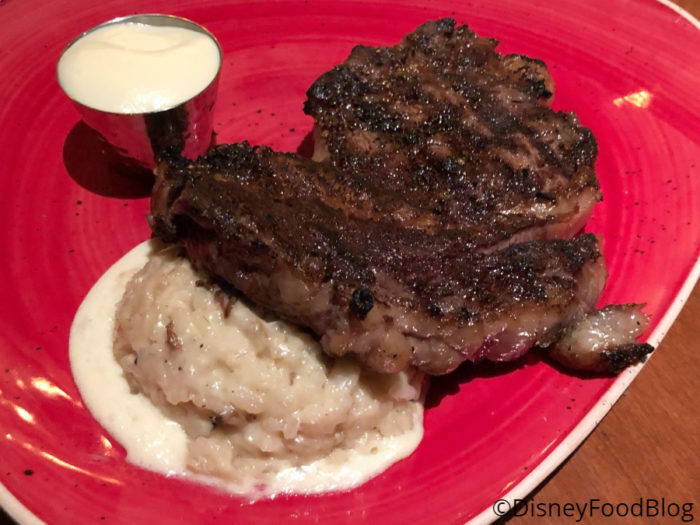 You are on a mission to try all of Walt Disney World’s steakhouses. You want to enjoy an elegant, but substantial meal in World Showcase. 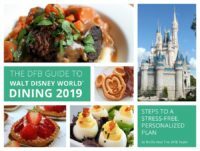 Your Walt Disney World vacation is for dining well. Signature dining all the way! You don’t have time for table service dining! There are rides to be ridden! The idea of spending that much in cash or credits doesn’t align with your budget. You don’t want a super heavy meal while you’re in the theme park. Le Cellier is a dining experience that is unique not just in Walt Disney World but in the greater world as well. Dishes here may be replicable, but the overall experience is unique. And we love that about Le Cellier. Whoever thought dining in a cellar was a good idea gets a big high five from us, eh! 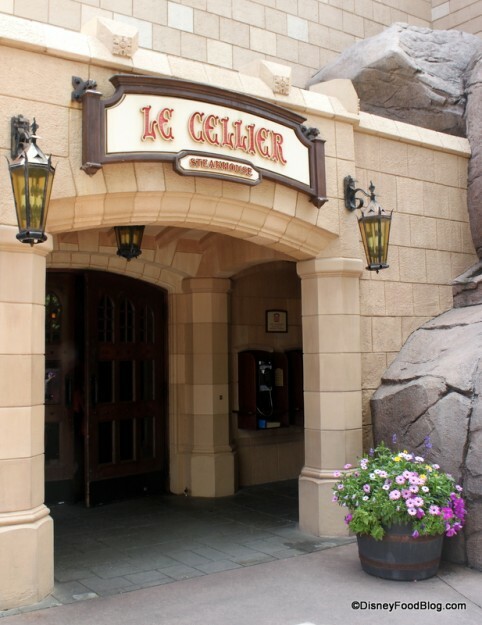 Have you dined at Le Cellier? Tell us about your experience in the comments! « Limited Time Valentine’s Day Menu at Maria & Enzo’s and Enzo’s Hideaway in Disney Springs! I was at Le Cellier in September and had a wonderful meal! The waiter recommended a white wine that was chosen by the sommelier to go with everything on the menu, but I can’t remember what it was. Any ideas what this could have been? Thanks! The maple whiskey-glazed Brussels sprouts were AMAZING!! I know it’s expensive, but it’s a well-worth-it meal and experience we always have to partake in. We just went between January 23-28th to the World! 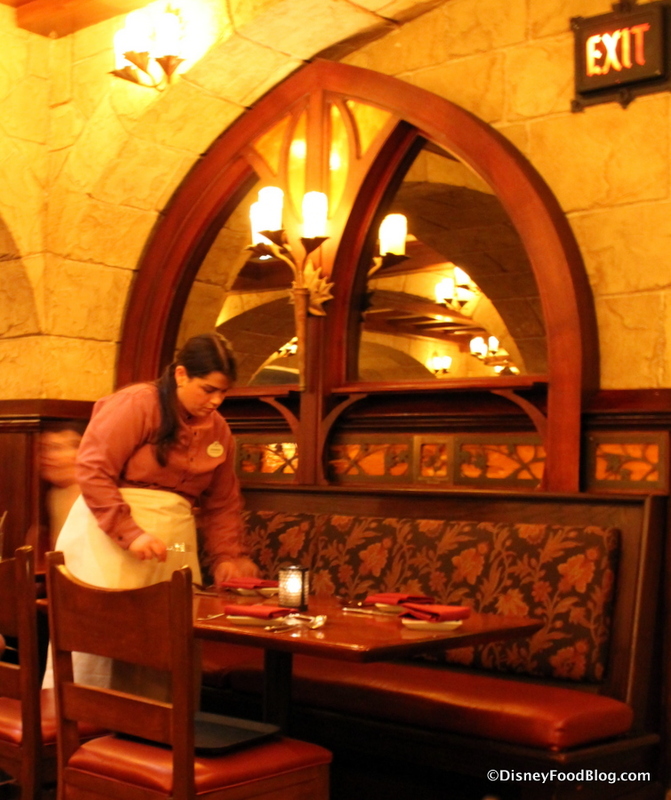 We dined at Le Cellier several years ago. 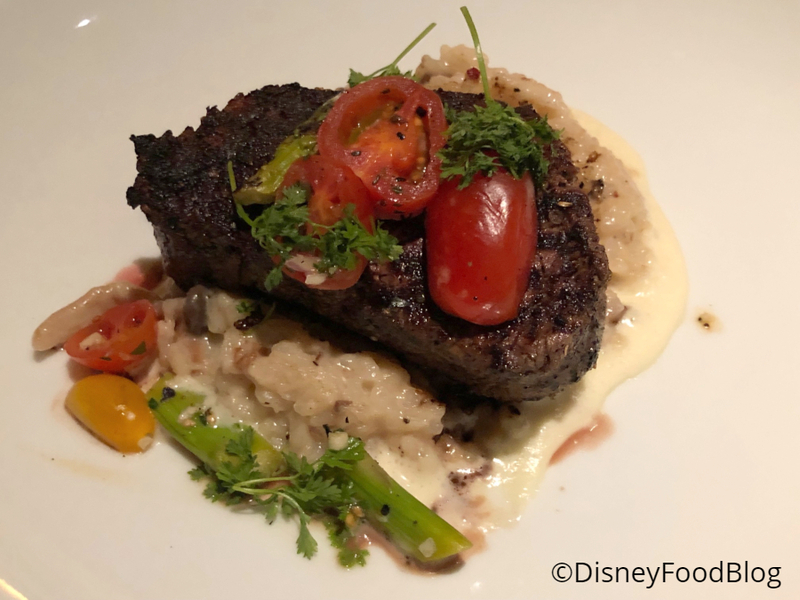 The food was incredible, by far the best steaks we’ve had in WDW. The only downside was the lighting level. 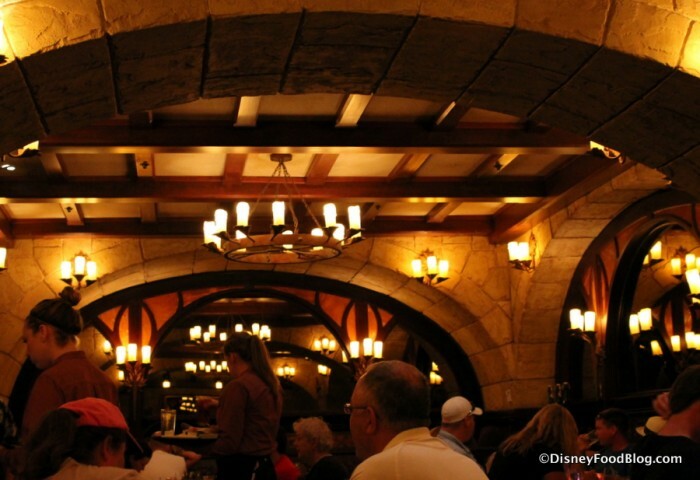 “And while there’s tons of lighting, somehow Le Cellier still manages to be a little shadowy.” is perhaps the understatement of the decade. I was forced to pull out my flashlight to get a good look at my food. I’m an astronomer, and grew up in a dark rural area, so I’m used to working in near darkness. 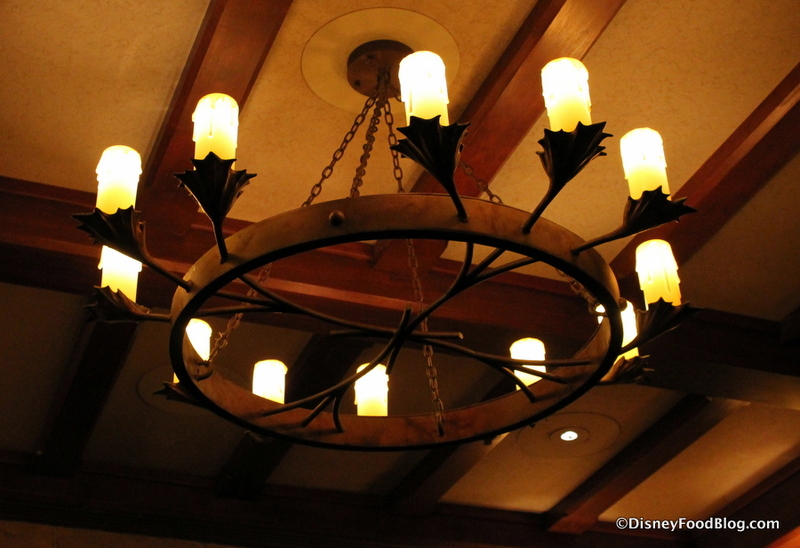 I can only imagine that those less accustomed to darkness than me would be effectively blind in Le Cellier LOL. I have had several disappointing meals here over the years and gave up on this place a few years back. I assumed it was because I’m used to frequenting premium steakhouses, including dining in the cellar of a Canadian steakhouse in Montreal. Based on this review I’m thinking of giving it one last try. I ate here last week and really enjoyed the filet. I also was able to get a kid’s size bowl of the cheddar cheese soup which was perfect. Unfortunately was too stuffed for dessert. Yes, over the years Le Cellier has gone from expensive to ridiculous…but here’s my tip for two people if you want to experience it without breaking the bank(especially if you’re without kids) and aren’t set on ordering entries. Both of you order a bowl of cheddar cheese soup and share a salad. The bread it free and is amazingly dipped in your soup. 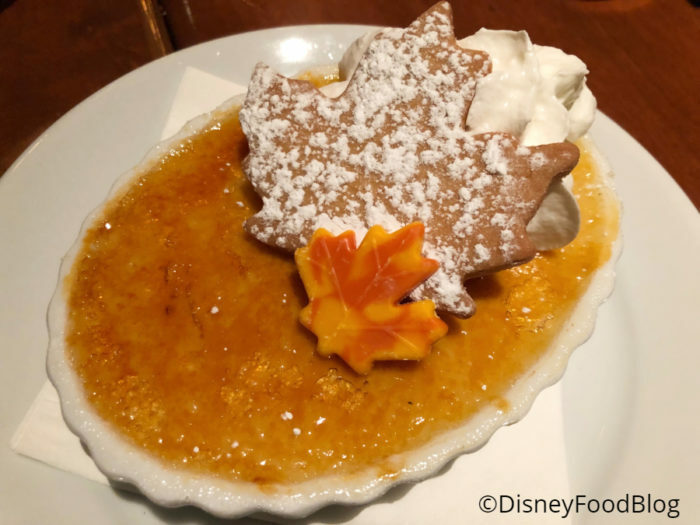 Save money on dessert by having treat in another country in the World Showcase….there are so many better dessert choices! Not seeing the ribeye in the menu anymore. Why would they do that?? Its arguably the most favorable cut there is. It was one of our go to restaurants. Very disappointed. The filet is a good steak but I would push children out of my way to get to the mushroom and truffle butter risotto. It’s. The. Best. 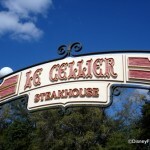 We’ve always thought the food at Le Cellier was very good but our last trip for lunch in 2012 will be our last. 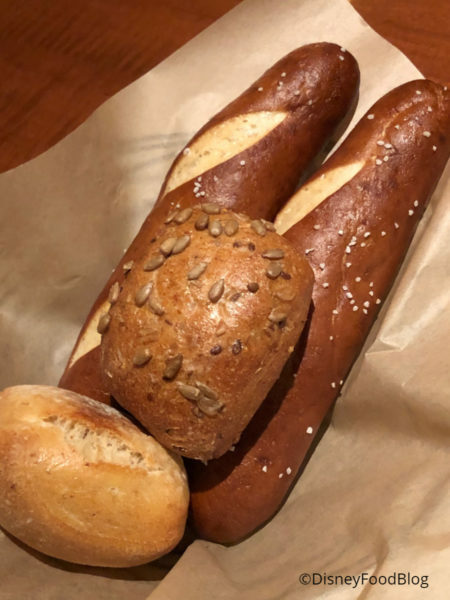 Love the pretzel bread and the atmosphere but prices are way past what we can afford. I plan the meals & park days for my family but I’m lucky to get them into more than one table service restaurant due to cost and even then it’s always lunch. 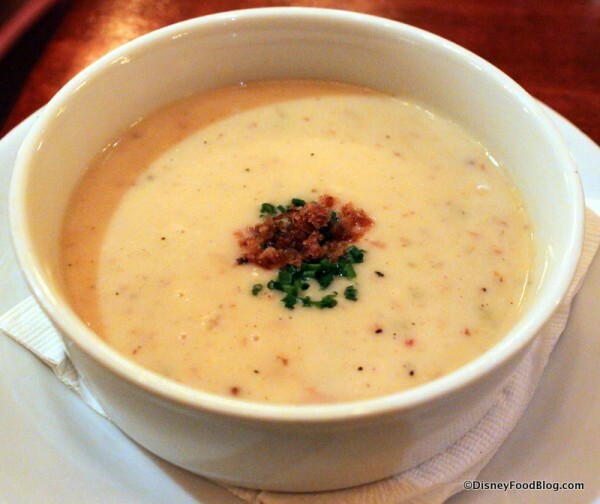 When we did eat at Le Cellier, I usually got the burger while everyone else just got bowls of the cheese soup so it wasn’t a huge splurge. 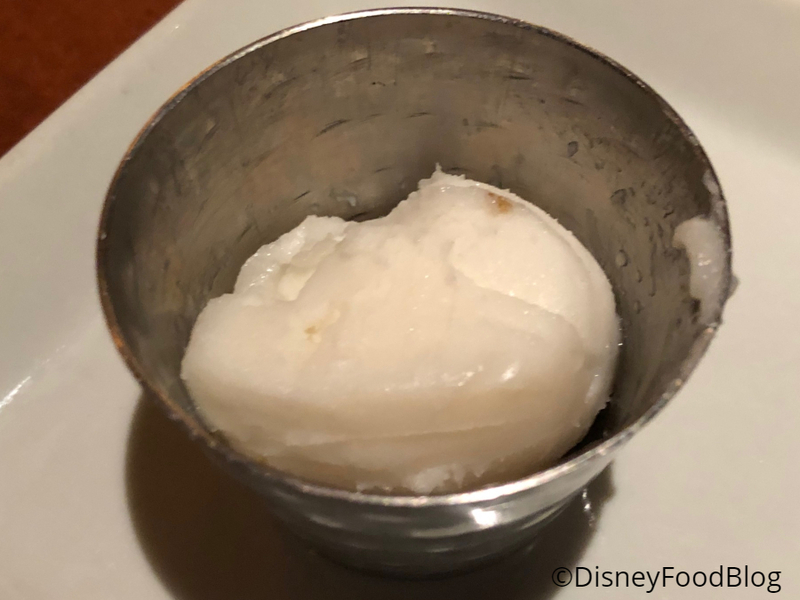 We dined at Le Cellier for the first time last week and LOVED it! We had the filet which was awesome. We went with the Gorgonzola creamed spinach for our side, which was delicious and if you want an alternative dip for your pretzel rolls, try using this dish. AMAZING!!! Planning a trip to Disney with my wife in September (it is only the two of us). We’ve considered eating here, or possibly venturing to Shulas at Dolphin and paying out of pocket. We will be on the dining plan, but if I use two credits here, that still puts me paying out of pocket another night. Trying to get the best bang for my buck. Been going here since it was a single table service way back. My one Q, why is it so small yet the building its in is the largest of any country’s?? Expand or make a 2nd floor hello!! No one likes having people site 24 inches from you listening in to your conversations! Expand for the Demand! I loved Le Cellier..it was the restaurant where i first tried and loved Risotto and Truffle. However, last year at both Festival of the Arts and Flower and Garden I got the filet from the outdoor kitchen and it was so awful I threw it out. I got a huge hunk of nothing but fat and gristle both times. So I’m not exactly excited to return. 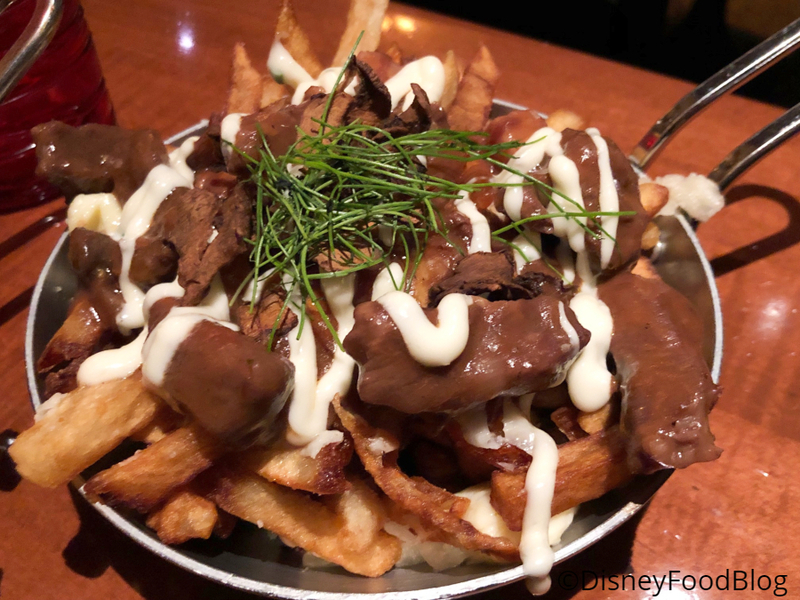 The wife and I went to Le Cellier last week on our first trip to Disney World and loved it. 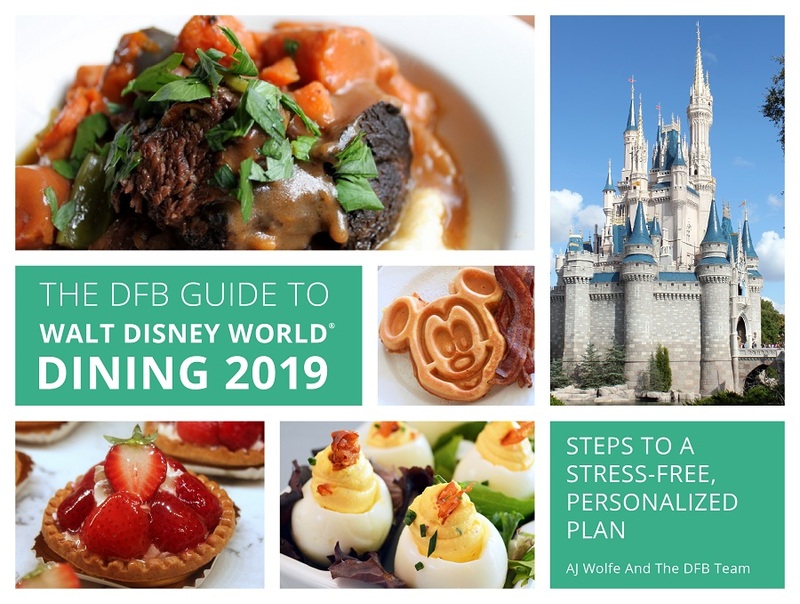 We didn’t have the dining plan for this trip, but are considering another trip with the dining plan. I’m having a hard time finding what might be included in a meal at Le Cellier with the two dining credits. Like would we be able to get any of the apps or sides as an inclusion on the dining plan? Especially loved the poutine and can’t wait to have it again. Any feedback is appreciated. 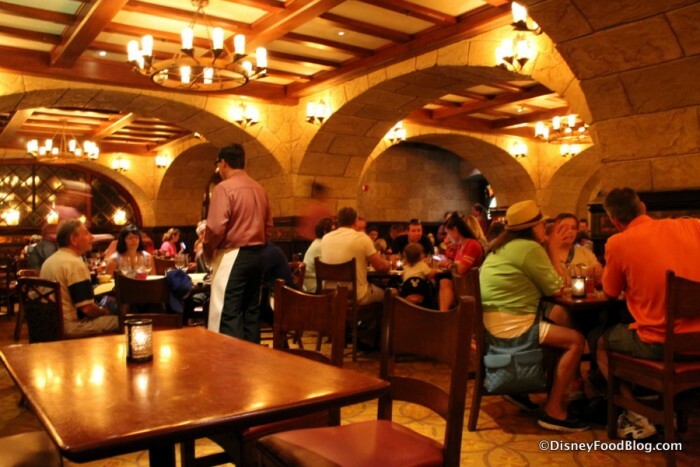 Justin, the standard Disney Dining Plan still only includes entree, beverage, and dessert at Le Cellier. If you’re using Deluxe DDP, you can also order an appetizer. On the dining plan husband and I only order one steak to share. With an order of poutine and a bowl of soup paid out of pocket we still had more food than we could finish, and saved two dining credits. I have always enjoyed the Filet Mignon at Le Cellier, but I would never want to eat the lard!! !